Jaipur, March 25, 2019: Export-Import Bank of India [Exim Bank] has, on behalf of the Government of India, extended a Line of Credit [LOC] of USD 38 million for construction of 1600 Borewells with Handpumps and 8 Small Water Systems in Mozambique. 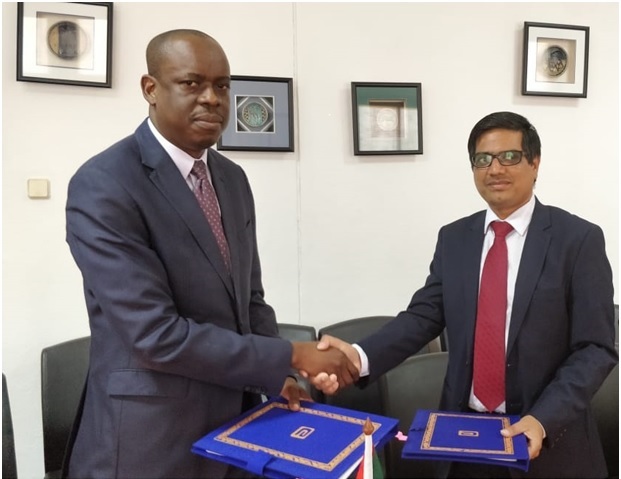 The LOC Agreement to this effect was exchanged between Mr. Vishal Harsh, Acting High Commissioner of India and Mr. Adriano Isaias Ubisse, National Director of Treasury, Ministry of Economy and Finance, Government of the Republic of Mozambique. With the signing of the above LOC Agreement for USD 38 million, Exim Bank, till date, has extended 14 (Fourteen) Lines of Credit to the Government of the Republic of Mozambique, on behalf of the Government of India, taking the total value of LOCs extended to USD 772.44 million. Projects covered under the LOCs extended to the Government of the Republic of Mozambique include rural electrification projects, transfer of water drilling technology and associated equipment, IT Park project, enhancing productivity of rice-wheat-maize cultivation, solar photo voltaic module manufacturing plant, Rehabilitation of Road between Tica, Buzi and Nova Sofala, construction of 900 houses and Procurement of railway rolling stock including locomotives, coaches and wagons. With the signing of this LOC Agreement, Exim Bank has now in place 246 Lines of Credit, covering 63 countries in Africa, Asia, Latin America and the CIS, with credit commitments of around USD 24.28 billion, available for financing exports from India. Besides promoting India’s exports, Exim Bank’s LOCs enable demonstration of Indian expertise and project execution capabilities in emerging markets.